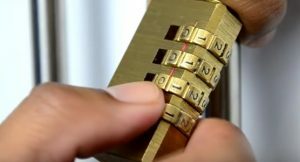 Have you ever wondered if you can actually pick a lock easily? Or is it just fan fiction? Well we are here today to tell you that is is possible with out having to be a professionally trained locksmith. Below are a few methods that you can use to open locks. Now if you are locked out of a property then you can use these methods. There is a time and place that real locksmiths need to be called. And if you really need a locksmith you should call them. These methods are really just for fun! If your lock is a combination lock then you can use the following method. You might be thinking how is it possible to ‘pick’ a lock that is a combination lock. There is no picking it’s just a code. Well the picking of that lock is quite simply knowing how to not use the code and get that lock open. So the method is quite simple. As you know when you move the numbers around on a combination lock you will hear a click. Now play with the number dial and you will see that is quite easy to move the dial for the most part. When you actually hear a louder click and the dial seems to snap into place and is harder to move out of that number. Then you have the number for that dial. Now you simply need to repeat the process for the other three or four dials and you will open the lock. If you are dealing with a master combination lock. Also known as a lock with a dial pad compared to the lock picture about then this guide on how to pick a lock is a good resource. 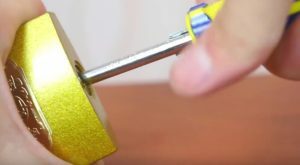 The next method we are going to explore is how to open a cheap store-bought lock. This method is more about breaking the lock as opposed to picking the lock. So you’re not going to be able use the lock again but this article is for person needs only. We don’t condone breaking the law whatsoever! Once you open your lock we suggest going and buying a stronger lock and not loosing the keys! You’re not going to end up with a functioning look once you’ve done this. The method is quite simple. You need to take a screwdriver that is about the diameter of the key that goes into the lock. And then smash the screwdriver into the locking mechanism. Just like shown in the image above. As the lock is a very cheap and weak you will eventually force the screwdriver into the locking mechanism, breaking your way through. Once you’re far enough into the look the screwdriver will be to turn. Once you are there just turn the lock. Welcome to Locksmiths 5 Less! We are a blog dedicated to providing security advice. Anything to do with the work you can do that a locksmith would charge for we cover! Why? As we want to make home security fair. We have nothing against locksmiths. We just believe in DIY first before calling a locksmith. And to call them out only when needed.